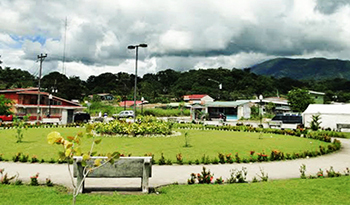 Ciudad Neily is the second largest city in Costa Rica’s Southern Pacific region, and still has been able to retain its historic and rural friendliness. Neily is situated in Corredores, a popular tourist destination featuring an urban lifestyle with exotic surroundings. There are beaches and forests in every direction, completely surrounding this Pacific city with adventures, wildlife, and surf. Residents and visitors to Neily can swim in the city’s “crystal holes,” which are lovely natural formations full of crystal-clear water that remains at a pleasant temperature year round. Those up for more adventure can try spelunking and exploring in the nearby caverns. People who enjoy their days spent hiking in nature and discovering adventure will find Neily to be the perfect home. There are a variety of housing options in Ciudad Neily. Higher-end options include 1-2 bedroom cabins, 3-bedroom homes, and even mansions surrounded by professionally maintained gardens, manmade rivers, and well lit waterfalls. Large plots of land can be had starting at $70,000. Regardless of whether a house is purchased or build upon a lot, one must add a few Adirondack chairs on the porch to fit in with the community. Larger investment opportunities include the purchase of a hotel or tourist business. 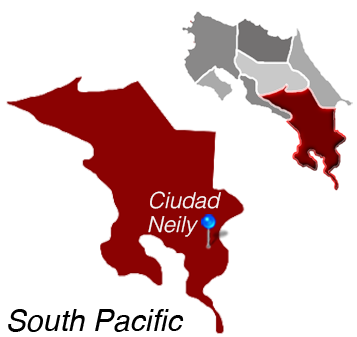 Ciudad Neily is Located in the South Pacific.